Chase Carpenter and Mary Schwartz, Highland’s 2019 Winter Homecoming King and Queen. Bottom row, from left: Brylinn Tuggle, Layla Grogg, Mariah McDaniel, Mary Schwartz, Brooklyn Baird, Cassady Sagar. Top row: Jon Jensen, Noah Dado, Tate Tobin, Chase Carpenter, Cam Cutrone, Chase Ray. 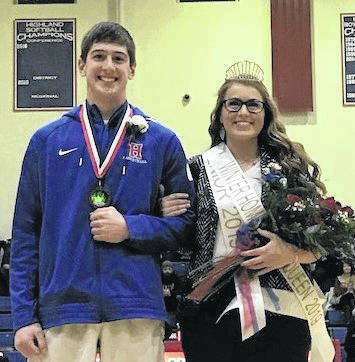 SPARTA — Mary Schwartz was crowned Highland High School’s Winter Homecoming queen, and Chase Carpenter was crowned king at homecoming ceremonies on Jan. 25. Highland Student Council sponsored the activities of the homecoming ceremony and the dance. The ceremony was held in between the varsity and junior varsity games at the boys basketball game versus Mount Gilead, with the dance following. Mary is the daughter of Sam and Laura Schwartz and was escorted by her father. Mary participates in softball. She is vice president of the Spanish Club, extremely active in her youth group, and also a member of student council. Mary plans to go to Marion Technical College for the first semester, then transfer to OSU-Marion to major in Early Childhood Education. Chase Carpenter is the son of Chad and Erin Carpenter and was escorted by his mom. Chase participates in football and basketball for the Scots. He is also a member of the Ohio Scholar’s Association. Chase plans to attend Otterbein University where he will play football and earn his degree in Nursing. Senior members of the court were Layla Grogg, Noah Dado, Mariah McDaniel, and Tate Tobin. Grogg is the daughter of Tom and Carrie Grogg and was escorted by her mother, Carrie. Layla is a member of the Highland Spanish Club. She hopes to attend Kent State University in the future to major in Forensic Science. Dado is the son of Donte and Angie Dado and was escorted by his mom. Noah plays golf and basketball for the Fighting Scots. Noah plans to go to college to become a math teacher in the future and possibly to coach. McDaniel is the daughter of James and Brandie McDaniel and was escorted by her dad. Mariah is a cheerleader and a member of Highland’s Business Professionals of America. Mariah hopes to attend Kent State University to major in Nursing. Tobin is the son of Trent and Amy Tobin and was escorted by his mother. Tate participates in football and baseball for the Scots. He is also a member of the Ohio Scholar’s Association. Tate plans to go to college to study Economics, and he would also like to play football. 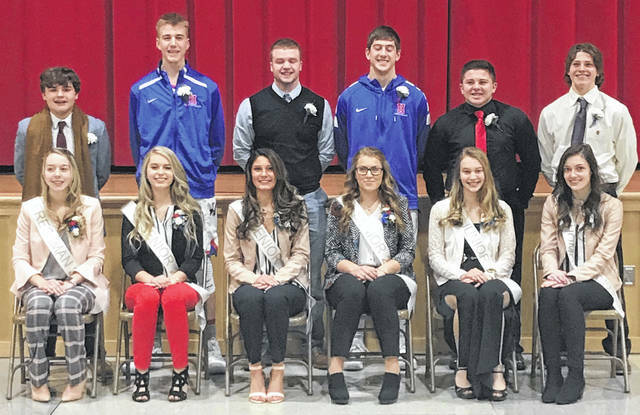 Other court members were Cam Cutrone, Brooklyn Baird, Chase Ray, Cassady Sagar, Jon Jensen, and Brylinn Tuggle. Cutrone was one of the junior class representatives. He is the son of Joe and Tonya Cutrone and was escorted by his mom. Cam plays football for the Scots, and he is a member of the Ohio Scholar’s Association. Cam’s future plans include attending a four-year university where he will study Education to become a teacher and a football coach. Junior representative, Brooklyn Baird, is the daughter of Bridget Baird and Micah Baird and was escorted by her brother Colton. She plays multiple sports for the Lady Scots, including volleyball, basketball, and softball. She also is a member of Highland’s NJROTC. In the future, Brooklyn plans to attend Columbus State to become a paramedic. Chase Ray was one of the sophomore representatives, and he is the son of Steve Ray and Angie Wenger. He was escorted by his mother. Chase participates in football and track for the Scots. He is also a member of FFA. Chase plans to either join the military or attend a two-year technical school. Female sophomore representative was Cassady Sagar, daughter of Chris and Laurie Sagar. She was escorted by her father. Cassady plays volleyball and softball for the Lady Scots. Cassady’s plans include attending a four-year university to major in Nursing. Freshman representatives were Jon Jensen and Brylinn Tuggle. Jensen is the son of Jon and Andrea Jensen and was escorted by his mom. Jon participates in football and baseball for the Scots. He is also in the student council, Youth in Government, and robotics. Jon plans to attend college to become an aerospace engineer. Brylinn Tuggle is the daughter of Chad and Jeni Tuggle and she was escorted by her dad. Brylinn participates in multiple sports for the Lady Scots, including volleyball, basketball, and track. Brylinn’s future plans are to go to college to pursue a career in the medical field, and she would also love to play basketball in college.